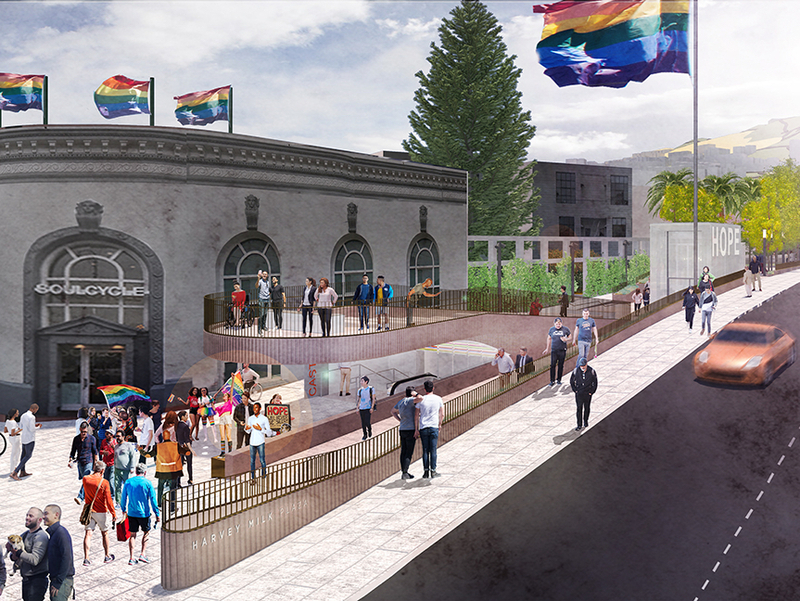 A key feature of the Harvey Milk Plaza redesign has been abandoned ahead of an SF Arts Commission meeting on Monday. 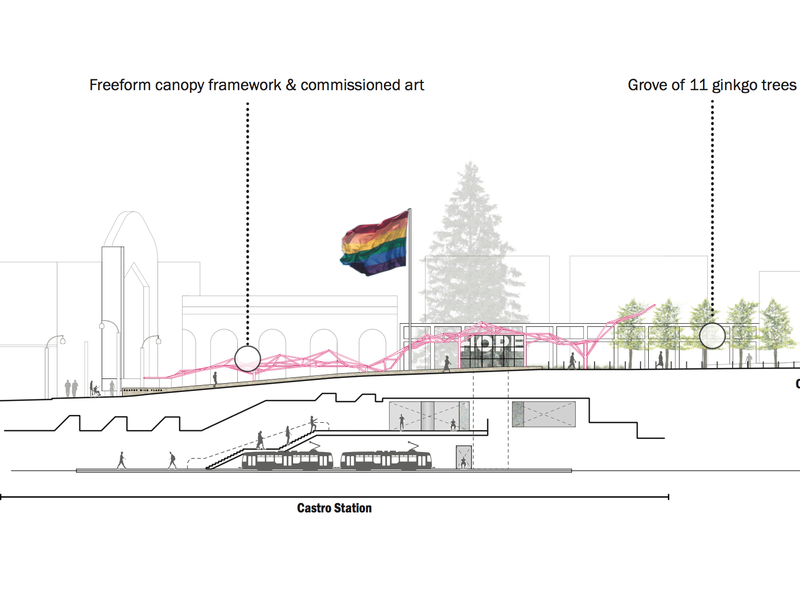 According to the latest redesign concept, Friends of Harvey Milk Plaza (FHMP) and project design firm Perkins Eastman have removed the controversial elevated terrace overlooking Castro Street. In its place they have proposed a freeform structure. 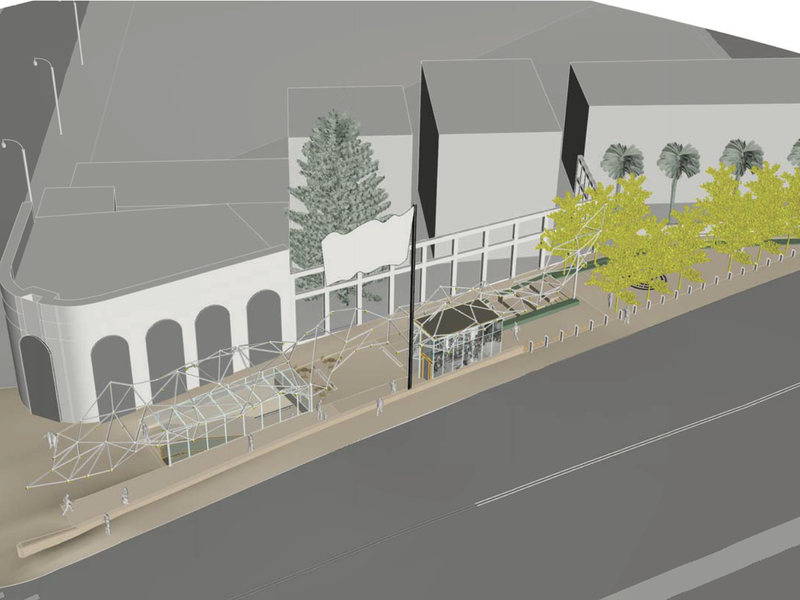 The new freeform structure would include a light, steel canopy framework, minimal vertical structures, an independent glass protection for the escalator and a security gate at stair entry to Castro Station. The elevated terrace was meant to serve as a gathering place, but opponents argued that it would attract unwanted behavior and crime. Hoodline spoke with FHMP's Brian Springfield, who confirmed the design change. 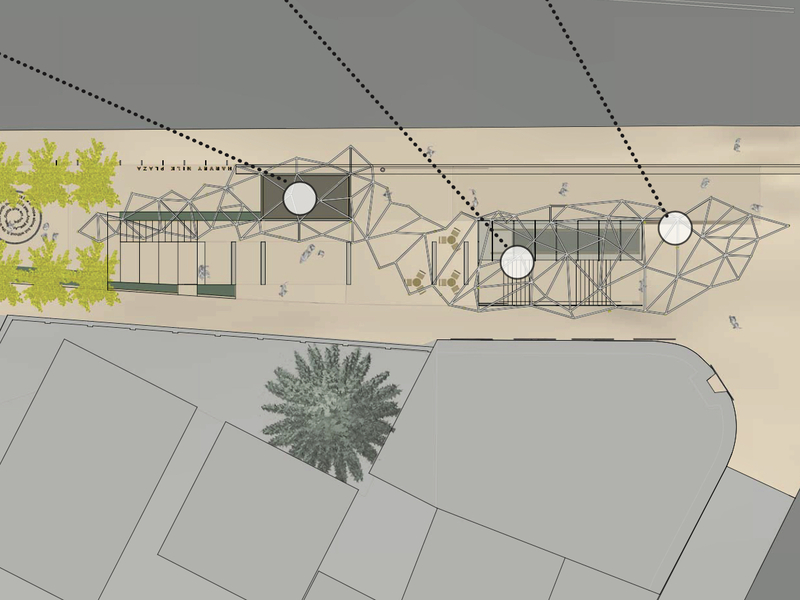 "The occupiable canopy that covered the stairs to the station entrance proved to be the focus of much of the criticism we heard -- from SF Arts Commission, from the community and even from critic John King." "The idea of an overhead sculptural element emerged during an informal review session with two of the Civic Design Review commissioners," said Springfield. Springfield emphasized that these drawings are just schematics at this point. "This is not a fully developed solution and should not be understood to be a design proposal," he said. "Instead, it is a description of a design direction that would be developed into a more fully developed solution." "Some exciting ideas have emerged, and we are looking forward to sharing with the community once SFAC has given their approval to this direction," Springfield added about the ongoing process. Criticism of the project from SF Chronicle's design critic John King played a major role in the new design. While King agreed that Perkins Eastman did a "good job" on the design, he questioned the need for a new plaza in the area. "When you try to imagine the redone plaza in the actual context, the case isn't nearly so compelling," he said in his critique published in October. "The location is awkward, at best, in terms of a plaza intended to be a tourist destination and local gathering space, especially in a neighborhood with so many other draws," King wrote. One suggestion the critic offered: "It might be easier to freshen up the current plaza and create an ongoing fund for its maintenance." According to the Bay Area Reporter, Arts Commission members and community members echoed King's sentiments at the October 15th meeting with the commission's civic design review committee. 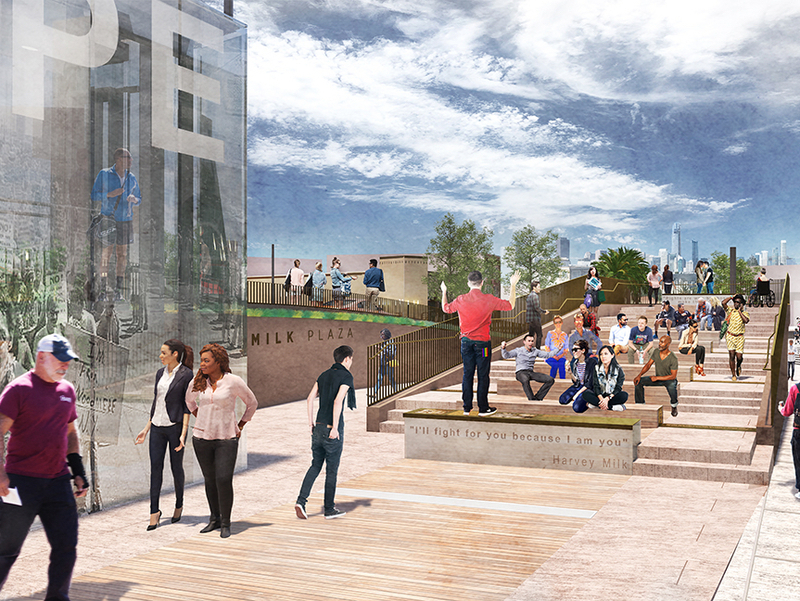 Arts Commissioner Kimberlee Stryker said the elevated terrace "throws things off" and "is a serious design issue that needs to be looked at again." Commissioner Dorka Keen shared her concern about the elements stating, "Think about the wind and how people are really going to use that space." Howard Grant, designer of the current Harvey Milk, has been a vocal opponent against tearing up his work and has asked for the project to be stopped. "It is a community asset that should be treasured, not demolished," said Grant. 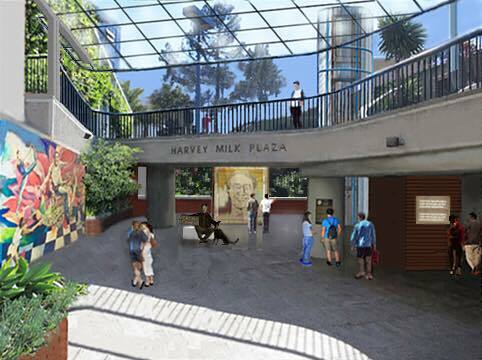 "Harvey Milk Plaza is at the top of the list of specific sites to be preserved. What is the compelling reason to demolish the plaza?" Grant asked the commission. In response to the new design idea, Grant told the B.A.R. this week that "it is gratifying to see the unfortunate bleachers replaced with what looks to be an imaginative transparent canopy!" Another critic of the project is John Goldsmith, who's created an online petition, "Save the Grove & Garden at Castro Muni Harvey Milk Plaza," and a Facebook Group, Save Harvey Milk Plaza. While Goldsmith and others have suggested just refurbishing the current Harvey Milk Plaza, Springfield said, "This is not feasible due to code compliance issues, as well as safety and security issues at the site." And preserving the site as a historical resource appears to not be possible at this point. "Preliminary review with city agencies have confirmed the site is non-historic based on age alone," said Springfield. As this project makes its way through the approval process, Springfield said the project team will continue to take public input. "If this direction is approved, then more detailed discussion and development of this canopy component can begin," he said. "Public input into this design direction would be sought out and encouraged," added Springfield. Once they have approval from the Arts Commission, Springfield and FHMP will determine the best way to listen to community members. Springfield also pointed out that the community has been asking for changes at the plaza for more than 23 years. Recent events, like the 40th anniversary of the assassinations of Harvey Milk and George Moscone and the Christmas Tree Lighting, saw crowds that spilled out onto the street and made accessing the Muni station nearly impossible. "It's important to remember that the existing design wasn't designed to be a 'plaza' at all -- it was designed to be a Muni station entrance," said Springfield. "Count me as one of the many in our community who believe Harvey deserves more than a Muni station entrance as representative of his contribution," Springfield said of the plaza that bears the LGBT icon's name.